Happily for those of us feeling the squeeze on our wallets, or for families who are out and about without a packed lunch, any child under 18 is entitled to a free breakfast and lunch during the summer months. The breakfast hours are from 8 AM to 9:15 AM, and the lunch hours are from 11 AM to 1:15 PM. 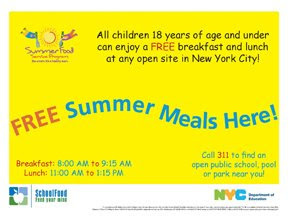 The Sunset Park Pool serves breakfast and lunch. The link above even has PDFs of the menus. And not to worry, there are vegetarian options available daily (PB&J and Cheese Sandwiches) for those of us who avoid hamburgers and chicken filets. The breakfasts also always offer cold cereals and fruit along with milk.